Fierljeppen, (pronounced fier‧ljep‧pen), sometimes referred to as polsstokverspringen in German-speaking East Frisia is a favorite sport of The Netherlands’ North Western Friesland province. Roughly translated to the self-explanatory “far-leaping” (originally: elegant jumping), its object is to run toward a body of water with an 8 – 13 (13,25 maximum) meter long pole (polsstok), jump over said body and reach the farthest distance possible on the opposite side. Sounds easy enough, right? Well, perhaps not so much when you consider that in order to maximize distance vaulters must climb as high as they can up the pole whilst embedded into the water (a flat plate on the pole’s bottom keeps it from sinking into the mud) before leaping off it’s top prior to hitting the ground. To grab the pole in the first place, vaulters must sprint toward it as it lies by the waterside. Each vaulter is allowed three tries per round. The first such fierljeppen jumps averaged about 10 meters with today’s being double that, averaging around 20. Considered the oldest continual sport in The Netherlands, and one of the oldest in the world, the origins of fierljeppen trace back to the 16th Century. Early mentions come from the book Then en Nu (Then and Now), which speaks of Willem van der Meij. In 1575, during the provincial 80 years war against Spain’s King Phillip II, Willem hid a message in his vaulting pole. As he evaded Spanish capture on his way to Alkmaar, Willem not only successfully hid the message but also held the advantage in traveling the watery countryside with the pole allowing him to cover as much distance in as little time as possible. At that time, the pole was of course not meant for sport vaulting but rather as a diverse tool for field workers. Due to the wet conditions of the landscape, it proved an invaluable item and multi-faceted in its use. One such use was for the collection of lapwing bird eggs, something of a delicacy during the golden age. To reach the lapwing nests, Frieslanders needed to cross the abundant ditches and plentiful canals that dotted the region’s fields. To do this they used long poles for jumping when necessary. Once the Frieslanders realized that the jump was an enjoyable enough activity in itself, they began organizing events centered on the action. The first “official” Fierljeppen event occurred in 1767 in Baard, Friesland, but it was not until the 20th Century when official rules, structure, and measurements were established. 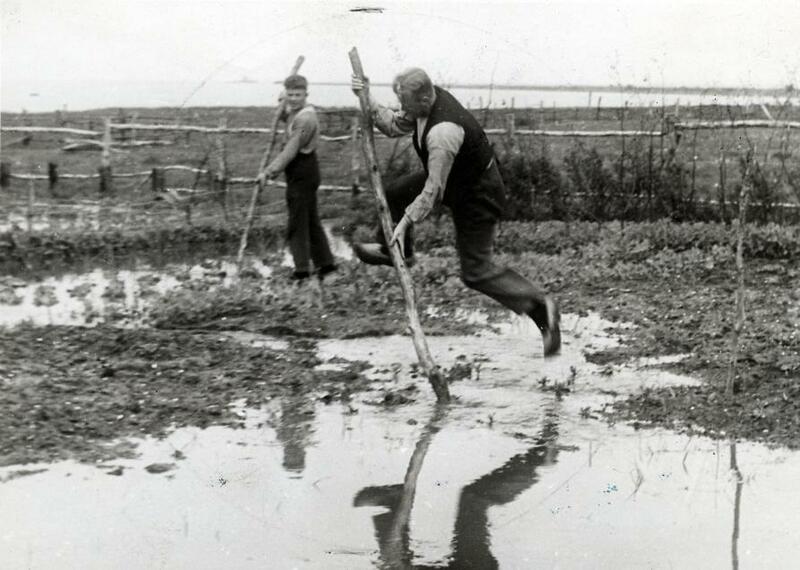 By the 1920s, Frieslanders began pole leaping in an official competition format. From these early days until the mid-1970s, wooden poles were used, ultimately replaced by aluminum before a 2006 switch to carbon. With new carbon poles, not only were rigidity increased, but also the length, which resulted in longer leaping distances. You might not think this would so consequential to the fundamentals of the sport, but it was. With longer distances leaped, landing sites needed to be adjusted. Where in early days sporting sites would essentially be the shore as they stood, modern landing sites are now constructed out of layered sand. In fact, even the leaping side was extended, as well as the jumped over water becoming deeper. Logistically, Fierljeppen is a sport combining geometry and physics. The farther a pole is placed from the runner, the more speed is needed in the sprint. With more distance and speed, the run-up allows for the pole to pass the dead center of gravity, which allows more time for climbing. The higher one climbs, the longer they are able to jump, thus covering the longest distance on the dismount and subsequent final sprint. Vaulters must make sure to maintain their balance, though, or they will find themselves falling into the water! It is definitely a sport requiring a healthy balance of agility and strength, much like gymnastics. The Fierljeppen community is made of The Nederlandse Fierljepbond (NFB), which has two members – The Frysk Ljeppers Boun (FLB) and the Polsstokbond Holland (PBH) – both founded in 1960. Combined they hold around 600 active Dutch fierljeppers. The league holds matches for Youth through 3rd class, where best leaps per match add to rankings. The higher the rank, the more matches a fierljepper is invited to including regional and national championships. Fierljeppen seasons take place May – September with the national championships, the National Fierljeppen Manifestation. Since its Frisian origins, Fierljeppen has gained in popularity around The Netherlands particularly in South Holland and Utrecht where record holder Jaco de Groot, who jumped a distance of 22.21 meters on August 12, hails from. Other notable jumps include women’s world record holder and Friesland’s own Marrit van der Wal, jumping 17.58 meters on July 16, 2016, and Jori’s de Jong, the junior record holder with a distance of 20.41 meters on August 9, 2016. Forms of Fierljeppen have also found themselves practiced around the world as well as in the media, due in no small part to some 100,000 annual spectators. Versions of the sport have appeared on American and Japanese television, via programs The Amazing Race and Ninja Warrior (Sasuke), respectively. You can read up on all things Fierljeppen, including on how to get involved and where to watch via the official Frysk Ljeppers Boun and the Polsstokbond Holland websites. Today, there are numerous ways to get involved, whether to take courses, watch matches, or take part in clinics with organizations around the country catering to every level. Fierljeppen is very much a tourist-attracting activity in The Netherlands and in Friesland in particular, so if you are looking for things to do that are as Dutch as you can get, and have exhausted your trips to Zaanse Shans and the likes, make sure you venture up north and get a taste of the extreme sport in action. Besides, with a sport so unpredictable, the difference between the next world record and a face full of mud is minuscule and who doesn’t enjoy watching a good splash!